The last generation of game systems was treated to “Activision Anthology,” a collection that had dozens of original Activision and Imagic classics from the Atari 2600 days. If you hooked up an arcade stick to your system, you had a pretty good gaming experience that brought back memories—as long as you weren’t playing a paddle game. See, you just can’t get that same paddle experience using a game pad or joystick. Therefore, on the Activision collection as well as other Atari compilations, games like Breakout, Night Driver, Circus Atari and Kaboom! just don’t work as they should and most people will most likely skip these games completely. As a collector of all this nostalgia, I was excited when I saw that four Activision games were included with the Wii compilation called Arcade Zone. Sure, all the other games looked like lame video versions of old school “hands-on” arcade games like bowling and hoops, but the four Atari classics, Atlantis (originally an Imagic game), Freeway, Megamania, and Kaboom, were promoted as having updated graphics with classic game play. So, not even sure how the Wiimote would be implemented in the playing of Kaboom, one of my all-time favorites, I purchased the collection. Well, guess what. My all-time favorite has to be UNLOCKED by literally playing through EVERY other game on the collection and getting a ‘high score’ on each. Ugh! So I set out on my quest to unlock Kaboom! I played the Hoops game, the Bowling game, an annoying ‘wheel of fortune’ game, a whack-a-mole game, an annoying tower building game, air hockey, and many more. 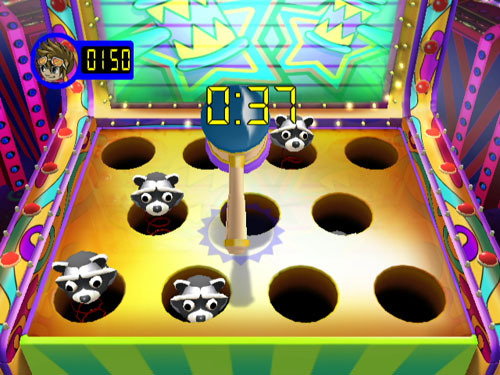 Then there were these REALLY annoying games where you had to prepare carnival food like pizza, corndogs and smoothies. 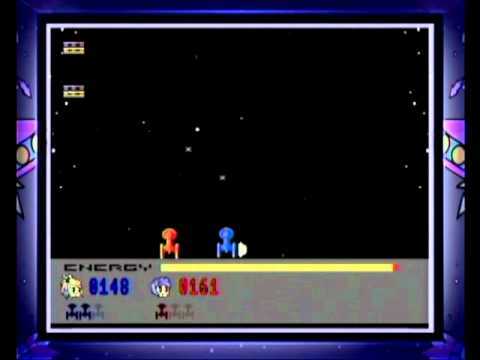 These challenges were SO clumsy, but once you understood what you needed to do (basically by watching the AI opponents on screen as they prepared their food), you could usually get the high score in one or two tries. As you continue to get high scores on each game, you get awards that unlock MORE games that you have to defeat before you can unlock the “Master Arcade Zone” where Kaboom! awaits. I ended up blasting through and conquering all the games in one night. But my hopes for Kaboom! were dashed early on because of the experience I had with the other Activision classics, which are open from the start. The graphics weren’t all THAT updated, but the real problem with the games is that it’s not a “free play” experience. The point of each game is simply to get the high score! Once you beat the high score, the game ends! Therefore, you don’t get to shoot at one wave of Megamania food invaders after another (yes, Megamania is basically Space Invaders with attacking junk food). The controls are never all that much like the originals either, and a Wii arcade joystick controller is not supported. Megamania and Freeway both work okay because you hold the Wiimote sideways and use the pad like a standard game pad. Actually, Megamania is closest to the original experience, but the graphics aren’t very different at all, so you’re more likely to just play it on one of your older compilations with a real arcade stick. Freeway, in my opinion, has been improved but still gets repetitive. Originally a knockoff of Frogger (most Activision games were knockoffs of one arcade game or another), Freeway’s big drawback was that you simply had to get across a highway by moving up or down on the screen. There was no weaving through traffic as in Frogger because you couldn’t move left or right. That has been changed on this update. Even so, the chicken is still basically just a flat, one dimensional outline of a chicken with no independent movement (like the hopping legs of the frog in Frogger). 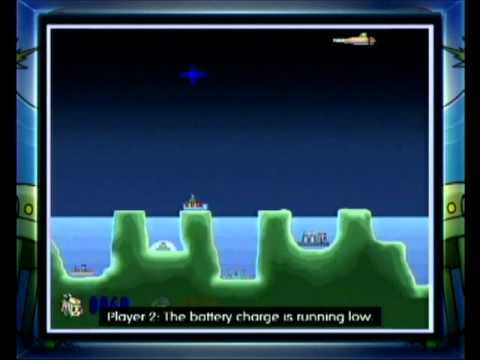 Meanwhile, Atlantis looks visually the most updated (maybe bumped up about as high as an Atari 5200 version would be compared to an Atari 2600 game), but instead of shooting from your bases on the ground level to protect your cities from the threats in the sky (Missile Command, anyone?) the update simply has you point the Wiimote at the screen to shoot them down, making this essentially a light gun game. Yawn. If I’m going to play a light gun game, it’s going to be House of the Dead. Finally, let’s get to Kaboom! 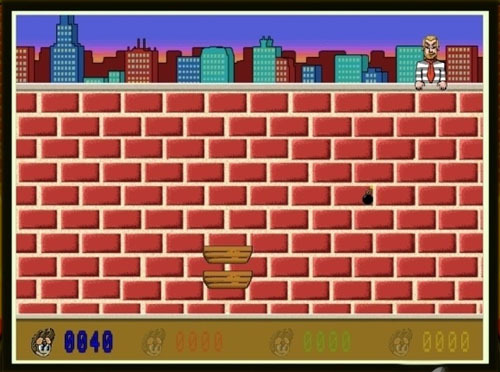 Visually, the bomber is now hanging over an actual brick wall instead of what used to look like a wall made of green grass, plus there’s a cityscape behind him at the top of the wall (which was also in the Atari 800XL computer edition of the game I had in the 80s). While the graphics look only slightly different, the game mechanics are glaringly different. For starters, YOU don’t decided when you want the next wave of bombs to drop by pressing a button as in the original game. Instead, the waves just come one after another with simply a slight pause between waves. Also, in the original, you’d have a wave of bombs that were spaced out across the screen as they dropped, followed by a wave of closely dropping bombs that actually allowed you to sweep across the screen in a specific ‘clean-up’ rhythm to catch them all. Those alternating patterns are gone, replaced by random, generic bomb assaults that force you to wave your Wiimote wildly. This type of control system effectively denies the intense accuracy needed in this game. With a paddle controller, you felt like your buckets were literally attached to the paddle by an invisible string. With the Wiimote, your buckets aren’t as ‘locked-on’ to your controller so it’s more of a hand-waving exercise than an actual test of hand-eye coordination. I remember back in the 80s my eyes would practically be burning holes in my television screen as I watched the bombs fall while my brain absorbed the visual knowledge and sent the instructions to my hand to spin the paddle with great precision left and right across the screen. It was a wild test of concentration that used to seriously put me in the zone. Those were the days. But hey, while the Wiimote might not be the same, anything’s better than using the upchuck Nunchuck. This entry was posted in Living in the 80s - forever, What I'm Doing With My Joystick and tagged Activision, Arcade Zone, Atlantis, Freeway, Kaboom!, Megamania, retro gaming, video games, Wii. Bookmark the permalink.